All Los Angeles real estate home owners know just how important safety is nowadays. There are a number of ways to ensure that your home is fully protected. Security systems just keep getting more complicated as technology advances. Perhaps one of the most important examples of this is the August Smart Lock. Los Angeles real estate owners know that having a smart home is crucial. This is because it helps homeowners manage their household without actually being there. The August Smart Lock gives users a unique keyless lock system. This innovative product works through wireless technology and offers its users an alternative means to gain access to their homes. The August keyless lock system is hooked onto the dead bolt you have at your home. Once it has been installed, homeowners will gain the ability to easily lock or unlock the house doors by making use of the mobile application. The main principle behind the August smart lock is granting homeowners full control over who gets to enter their space. For instance, the keyless lock system can grant temporary and conditional access to anyone who needs to enter the house. This will certainly come in handy once the cleaning lady swings by your place while you aren’t there. The smart lock also helps homeowners keep track of who enters and leaves the house at any given time. Aside from being able to fully control who has the ability to access your home, homeowners will also have the ability to invite people through their Facebook connections. 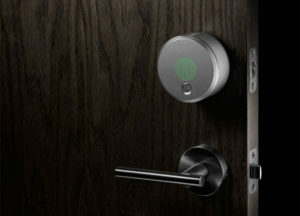 While it has a number of important perks, perhaps the most important feature of the Smart Lock is that it eliminates the need to connect to a Wi-Fi network. This is because the device relies on Bluetooth low energy technology. This means that your control over who gets to enter your home is not limited by your access to the internet. The August Smart Lock is projected to set homeowners back at least $199 and is said to only take around 10 short minutes for the product to be installed. When you think about it, the $199 price tag is most certainly worth it. Make sure to give this new product a try. You can preorder the August Smart Lock here.